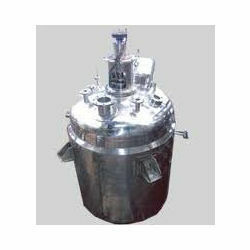 We are the leading Jacketed Reaction Vessels manufacturer and supplier of these reactors can be availed at affordable prices. The Jacket Type Reaction Vessels provided by us are made up using premium quality products. Leveraging upon the rich industry experience of our professionals, we are able to manufacture and supply a competitive line of Pharmaceutical Equipment and Machines. In our product array, we have available with us a wide variety of Pharmaceutical Equipment, Chemical Machines, Food Industry Machines and Pressure Vessel Machines. We are also offering Pharmaceutical Machines, Fluid Bed Dryer, Pressure Vessel & Filling Vessel, Zero Holdup, Filter Press & Horizontal Sparkler Filter Press, Vibro Sifter Machines, Multimill, Membrane Filter Holder, Pharmaceutical Tank, Turnkey Plants, Automatic Ointment Manufacturing Plant, Syrup Manufacturing Plant, Conveyor System for Packaging, Track Loading Conveyor, Powder Filling Screw, Belt Conveyor & Flexi Conveyor System to the clients. Clients can avail our machines in both standardized as well as customized configurations. Our products are used in food processing, chemical and pharmaceutical industries for a wide range of applications. These products are carrying features like corrosion resistance, high performance, high temperature resistance and sturdy construction. We provide quality tested products to the clients that are ensured for attributes like design, performance, reliability and durability. Clients can ask for customized, urgent or bulk orders for the products. We efficiently deliver the orders within minimum turnaround time. Cargo, road or air mediums can be chosen as the transportation media for delivering orders within the stipulated time frame. Further, for the ease of our clients, we accept payment via cheque.